Amazon Prime members can get early access to these deals starting at 12PM today. 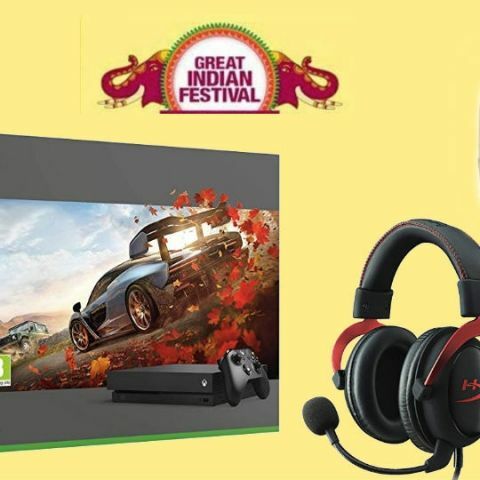 Amazon is kicking off its biggest Great Indian Festival Sale today at 12 PM, with exclusive early access to Amazon Prime members. The sale features discounts and offers on hundreds of products across various categories. The sale will open for non-prime members from October 10 and will go on for five days till October 15. So, if you are an Amazon Prime emember, take a look at some of the best Prime early access deals on games, gaming consoles, monitors, and Wi-Fi Routers which will be exclusively available to you starting noon today. The Samsung monitor supports Extra-wide viewing angles, AMD FreeSync 5, 6. 54.6cm (21.5) Full HD Monitor with Super Slim Design, circular stand, 16:9 aspect ratio, 1,920 x 1,080 resolution, 5 ms response time, 60 Hz refresh rate. Own the Xbox One X Forza Horizon 4 Bundle, which includes full-game downloads of Forza Horizon 4 and Forza Motorsport 7 that are Xbox One X Enhanced. Experience dynamic seasons in a shared open-world while you race and drive in Forza Horizon 4. The Seagate backup plus ultra slim portable drive is 9.6mm thin, features High-speed USB 3.0 and 2.0 connectivity otters plug-and-play functionality on your PC without the need of an external power supply. The drive is formatted for Windows computers install the provided NTFS driver for mac driver on your Mac computer and you can use the drive interchangeably between Windows and Mac computers without reformatting. Via the downloadable Seagate dashboard software, you are provided with tools for local, mobile, cloud and social media backup. Run a one-click backup or schedule an automatic backup plan plus portable drive at your convenience. Install the Seagate mobile backup app on an iOS or Android mobile device to back up all of the pictures and videos from the device to your external drive or the cloud. Additional cloud connectivity is available for Google drive and dropbox, as well as social media backup tor your Facebook and Flickr accounts. HyperX Cloud II features a USB sound card audio control box that amplifies audio and voice. This next-generation headset generates virtual 7.1 surround sound with distance and depth to enhance your gaming, movie or music experience. Get WiFi speeds-up to 2.53Gbps (800+1733 Mbps). Quad-Stream technology delivers WiFi to multiple devices simultaneously for faster speeds. Four high-performance external antennas deliver maximum range. Dynamic QoS prioritizes network traffic by application and device. 1.7GHz dual-core processor boosts performance for gaming and streaming. Twin USB 3.0 and eSATA ports offer high-speed, USB storage-ready access. With the latest firmware release your Nighthawk X4S now includes .NETGEAR genie remote access, ReadyCLOUD, Open VPN access on mobile devices, and Kwilt integration. Netgear AC1200 Dual Band Wi-Fi Range Extender boosts your existing network range, delivering AC dual band Wi-Fi up to 1200Mbps. Fastlane technology improves performance using both Wi-Fi bands. High-power amplifiers and internal antenna array increase range for whole home coverage. It works with any standard Wi-Fi router and is ideal for HD video streaming and gaming. The GW2270H VA LED monitor brings 3000:1 high contrast ratio, 178°/178°wide-viewing angle, dual HDMI and BenQ's eye-caring design, which consists of BenQ‘s Flicker-free technology and Low Blue Light modes. The 27-inch 1080p Full HD Samsung LED monitor features AMD FreeSync, Game Mode to optimising screen colours and contrast for gaming, Eye Saver Mode to reduce blue light emissions, extra-wide 178-degree viewing angle.